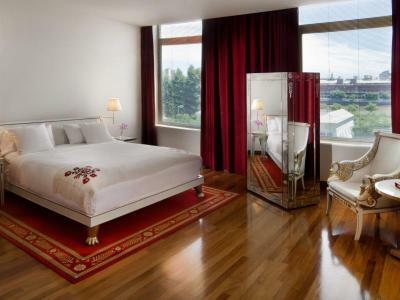 Park View Rooms feature minimalistic pure white leather furnishings and delicate hand embroidered artisanal throws that glow in contrast to the deep cabaret-red carpets and velvet drapes framing scenic views of the Puerto Madero gardens below. Antique-inspired filigreed mirrors, lapacho hard wood floors and arabescato marble bathrooms create a sanctuary infused with distinctive Porteño elegance. Premier Park View Rooms offer a privileged vantage point of Buenos Aires with sweeping views from Rio de la Plata to the Costanera Sur Ecological Reserve and Puerto Madero Park. Pure white leather furnishings and delicate hand embroidered artisanal throws are softened with cabaret-red velvet drapes and original artwork. Antique-inspired filigreed mirrors, lapacho hard wood floors and arabescato marble bathrooms create a sanctuary infused with distinctive Porteño elegance. Bask in a resplendent sunset over the city’s stretching horizon from a cozy window seat tucked between plush red-velvet drapes in a spacious Skyline View Room. Pure white leather lounge chairs and antique-inspired furnishings epitomize classic Porteño elegance with engraved filigree mirrors, delicate hand embroidered artisanal throws and lapacho hard wood floors. 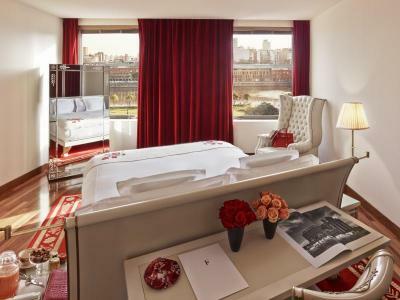 The hotel’s most coveted rooms feature breathtaking views of Buenos Aires’ captivating skyline and the historic San Telmo district. 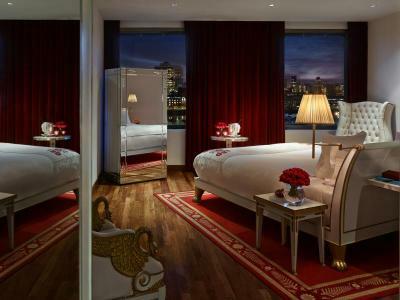 A respite of minimalist elegance outfitted in custom-designed pure white leather furnishings, cabaret-red velvet drapes and 19th century-inspired clawfoot bathtubs, Premier Skyline View Rooms seduce visitors with the enchanting spirit of Buenos Aires. 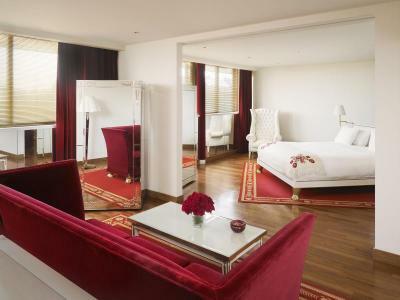 The Duplex Suiteoffers two floors of lavish comfort with rich cabaret-red velvet décor and pure white leather furnishings. Antique-inspired filigreed mirrors, delicate hand embroidered artisanal throws and lapacho hard wood floors capture the nostalgic spirit of the neighboring San Telmo district. 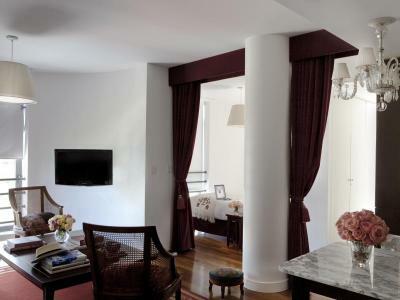 Luxurious arabescato marble bathrooms and large picture windows overlooking the city’s canopy of centennial trees offer a tranquil respite to delight in the splendor of Buenos Aires. The Loft Studio is a luminous apartment with stunning views of the city skyline or lush gardens. 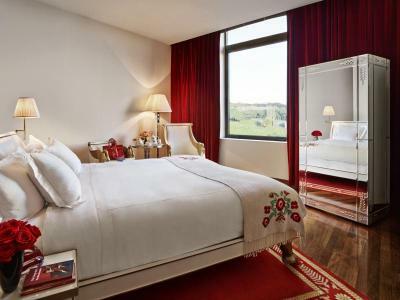 Red-velvet draping, deep cherry woods and delicate hand embroidered artisanal throws complement lapacho hard wood floors and arabescato marble detailing to create an airy sanctuary ideal for long-stay guests. Designed with a living room, dining area and kitchen, along with a the Loft Studio offers guests an authentic Buenos Aires residential experience. The Corner Studio is a bright apartment with floor-to-ceiling windows overlooking the city skyline and the hotel’s exclusive swimming pool. Minimalistic pure white leather furnishings and delicate hand embroidered artisanal throws glow in contrast to the red velvet sofa and drapes. 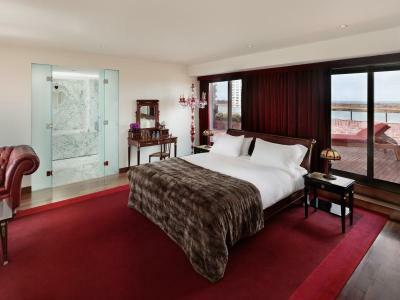 Filigreed mirrors, lapacho hard wood floors and arabescato marble bathrooms create an airy living space ideal for extended stays. 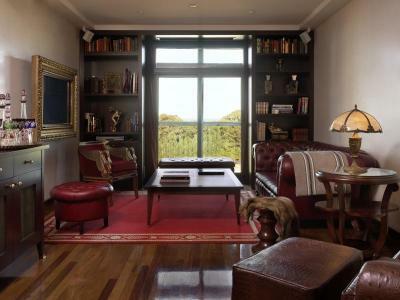 The Corner Studio offers an authentic Buenos Aires residential experience. The Porteño Suite is a vibrant harmony of light, color and glass. A bold red velvet sofa and matching drapes soften pure white leather furnishings with gilded trim. Antique-inspired filigreed mirrors, lapacho hard wood floors and delicate hand embroidered artisanal throws add a flourish of Buenos Aires refinement to the space. The suite’s showpiece is a stunning, free-standing custom bathtub at the center of an arabescato marble bathroom. 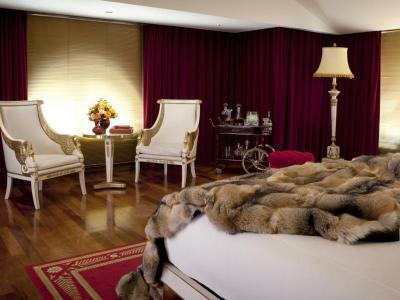 The Grand Duplex Suite is a two-story refuge of sumptuous cabaret-red velvet décor and pure white leather furnishings with antique-inspired filigreed mirrors, lapacho hard wood floors and arabescato marble bathrooms. Linger over Puerto Madero harbor sunset views from the spacious living room or slowly unwind upstairs with a cocktail from the vintage beverage cart. Surrender to relaxation nestled in delicate hand embroidered artisanal throws and custom Faena linens or soaking in an oversized whirlpool for two. A fiber-optic teardrop crystal chandelier with shifting colors characterizes the Tower Suite’s fusion of timeless romantic elegance with contemporary Buenos Aires edge. The exclusive three-story suite is a seductive combination of rich dark woods with clean lines and glowing crystal candelabras. An impressive arabescato marble-clad bathroom with an oversized whirlpool bathtub and open waterfall shower graces the entire second floor. The lounge and master bedroom feature red velvet furnishings with gilded accents and scenic views of the Costanera Sur Ecological Reserve. Draped in red velvet with gilded accents and shimmering chandeliers, the Presidential Suite is an opulent retreat of exquisite comfort. A gracious space to host a private gathering in Belle Époque fashion, this suite features a lavish dining table seating eight, cut-crystal dinner service and a dedicated butler. 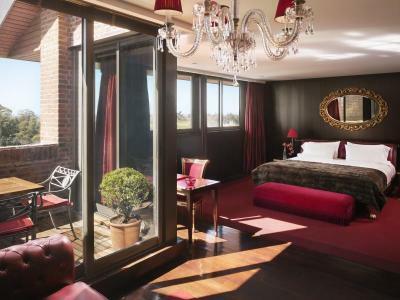 Two furnished terraces offer magnificent views of the Buenos Aires skyline and Puerto Madero’s manicured gardens. 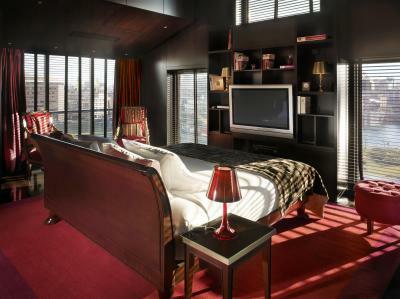 The Presidential Suite can be converted into a two-bedroom suite upon request. The Imperial Suite is a grand two-story residence designed for regal living with curated San Telmo antiques, floor-to-ceiling arabescato marble baths and a stately hand-crafted dining table that accommodates 10 guests under a majestic crystal chandelier. Ideal for entertaining, the ground floor features a sophisticated drawing room that connects to the dining room and full-service kitchen. 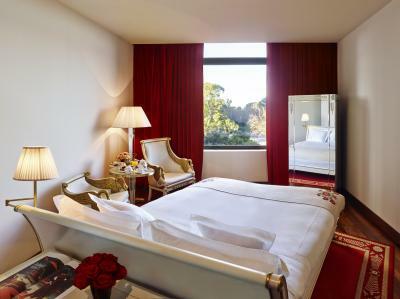 The second floor master and guest bedrooms are flanked by two expansive terraces with striking city and nature views. 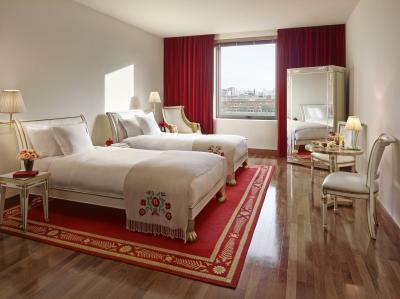 The hotel’s namesake Faena Suite embodies the genuine style and creative vision of its owner Alan Faena. The spacious two-bedroom suite is a curated collection of contemporary artwork by local artists, diverse libraries, antiques and artisanal keepsakes from around the world that create a cosmopolitan sanctuary to reconnect with the poetry of life. 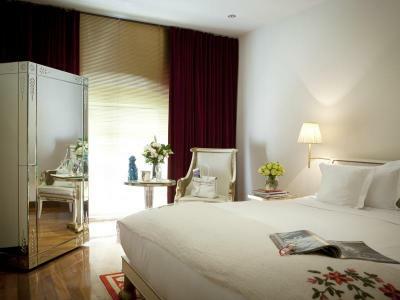 Panoramic skyline views of Buenos Aires and Puerto Madero can be enjoyed throughout the suite. Inspiring both leisure and contemplation, the Faena Suite defines the art of sophisticated hospitality.